The Cup and Saucer trail is an integral part of visiting Manitoulin Island. No one can deny the magnetic pull of this beautiful landscape. During the summer and fall months, the trails are packed with hikers, dogs, and families - all trekking up the rock with the same goal: to reach the peak. What is the Cup and Saucer trail? Named for its unique rock shape, the Cup and Saucer trail is near Sheguindah, on Manitoulin Island. It’s a part of the Niagara Escarpment, with 230 foot high cliffs spanning across 2 km (the entire trail is about 14 km, including the various routes). The Niagara Escarpment runs 725 km through the United States and Canada, proudly housing the oldest forest ecosystem in eastern North America. The Escarpment is a World Biosphere Reserve, meaning that it has plant and animal life that draws widespread interest and promotes special research and education, aiming to protect and develop the area. It began to form 450 million years ago, resulting in the beautiful limestone and shale rock formations we see today. The sharp cliffs and elevated ledges are a result of the limestone’s high resistance to the flow of water and glaciers over the years, paired with rocks that have different speeds of erosion. What is the cultural story of the Cup and Saucer trail? In June 2018, there was a ceremony where M’Chigeeng band members unveiled the signs detailing the story of the special area. The signs explain that the Ojibwe name, “Michigiwadinong,” means “bluff in the shape of a spearhead.” The Expositor explains that it is “the place where Nanabush lay down his spearpoints while fleeing Iroquois warriors he had been tormenting for countless generations.” Nanabush, also known as Nanabozho (as well as other names and variations), is a prominent trickster and cultural hero in Ojibwe storytelling. Stories of Nanabush speak of his great teaching ways, but he is known for mischief-making as well. Why is the Cup and Saucer trail so popular? The trail has gained wide attention because of the stunning views, trails ranging in varying difficulty, and the family-inclusive environment. 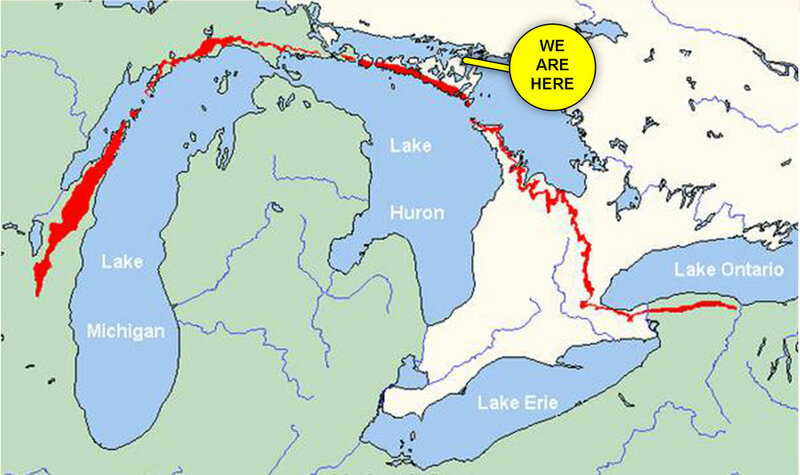 Thousands of people come from all over Ontario to experience hiking this breath-taking trail. There are four designated lookout points, but everyone aims for the well-known east vantage point - a rock ledge that offers a panoramic view of the millions of trees that flock the island. Many people describe this view as being one of the best they’ve ever seen, and commend its fantastic photo opportunities. Standing on the edge of this cliff is electrifying, with the wind whipping past you as you hover above the sprawling landscape. The Escarpment Biosphere Conservatory added ladders, ropes, and stairs to the trickier parts of the trail - with the hopes that the trail would remain accessible and family-friendly. With these new additions, the trail is being enjoyed immensely and with great enthusiasm. How long does the hike take to complete? There are 3 different colour-marked trails. The red one is the main trail, and it is about 5 km roundtrip. It leads to most of the lookout points, including the very highest peak. Many hikers claim that this trail takes between them 1.5 - 2 hours to complete, including the time spent checking out the various lookout areas. The adventure trail is 500 meters, and just a small detour off the red trail. Many people love this diversion because of its challenging-but-reasonable terrain. At one point, you’ll find yourself clinging onto a taut rope as you scale the side of the Escarpment. Countless reviews rave about the adventure trail, describing the challenge as exciting and even a lot of fun for kids. The blue trail is a longer extension of the hike. It brings you through the forest, and remains mostly flat throughout its entirety. It is the easiest trail to complete, but its also the longest - an extra 5km. Even though it’s currently the off season for the trail, it doesn’t hurt to admire this beautiful landscape and the endless adventures that hikers and visitors endure every year. There’s a special place in our hearts for the Cup and Saucer trail. This is why our brand new antioxidant smoothie at 3 Cows and a Cone is named for this magnificent piece of Manitoulin. We’re introducing the Cup and Saucer antioxidant smoothie! On Tuesday November 6th, you can get this delicious beverage for just $5! Filled with cranberries, blueberries, blackberries, raspberries, and strawberries, you’ll get just the healthy kick you need to start your day (or finish your day, there’s no rule! ).